Home Credit Cardholders get 0% interest on a 6-month installment plan when they purchase a min. single-transaction of P3,000, maximum of P25,000, in the participating stores of Aerophone. The promo is open to all Home Credit cardholders whose accounts are active, current, and in good credit standing*. Home Credit has the right to approve or decline a transaction by a cardholder. *Cardholders in good credit standing are those with cards that are not reported lost or stolen, whose accounts are not delinquent, not under investigation due to suspected fraud, and those who have not violated any of the Home Credit Card Terms and Conditions. 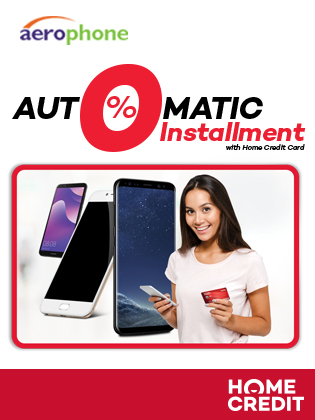 Installment plans shall be transacted to terminals enrolled by the partner merchant under the 0% interest installment plan. The Home Credit Card terms and conditions on monthly installment plans shall apply to this Promotion. The Promotion cannot be used in conjunction with other promotions or loyalty campaigns or services of Home Credit. Per DTI-FTEB Permit No. 4833 Series of 2019.